Filed to: SRSLY?Filed to: SRSLY? Yes, apartment building of mine? Why IS the heat on? This would be a perfectly logical question, had it not already been answered. We'll get to that in a minute. I actually originally spotted this earlier today, when it was just "WHY?" and "Excellent question." Since then apparently someone has pointed out that it is chilly out (except not really. it's kind of perfect out, actually. hopefully tonight it will be literally chilly, I would like that), and that DC law requires all apartment buildings have heat by October 15th. You see, this would be less funny if we hadn't all received an email informing us that not only was the heat on, but WHY. It really is the law. 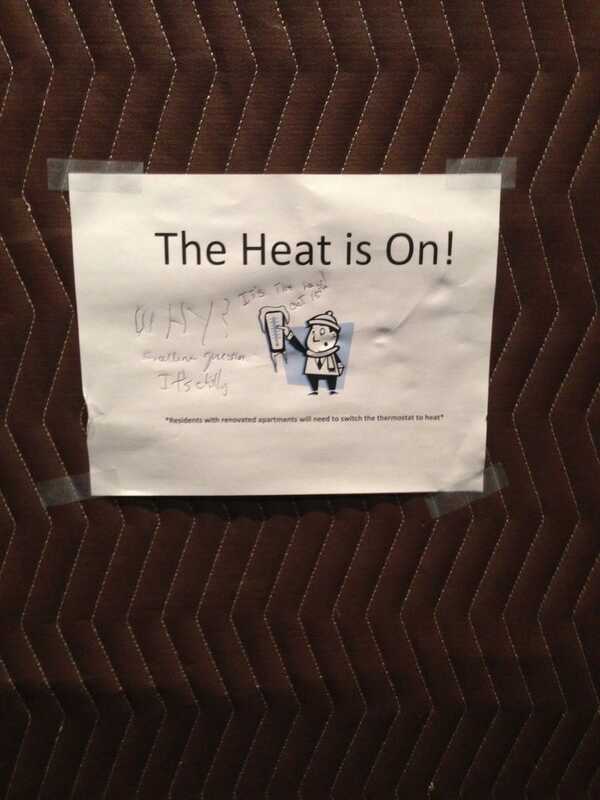 I think I mostly just love the fact that four separate someones felt the need to write these things on the silly paper sign reminding us that we need to switch over from a/c. I think I am getting very close to opening the champagne early.